“This is the small one,” says the man with the New Jersey drawl. He’s called Kevin and is talking about the enormous lens fixed to the front of his fancy camera. “The big one’s at home,” he chuckles. 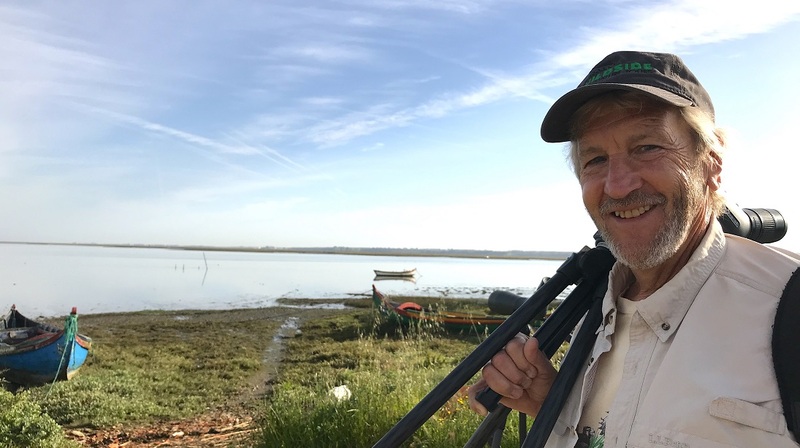 We’re in Portugal, just outside Lisbon, peering – through cameras, telescopes and binoculars – over the mudflats and salt marshes of Hortas, at curlews, egrets and dunlins. A white wagtail builds a nest in an abandoned fishing boat. A peregrine falcon soars overhead. The proud author – with his beaky-peaked baseball cap and squinty Clinty eyes – is one of a group of 13 birdwatchers. They drew up in a small coach just minutes after my companion and I arrived at this peaceful location with our Portuguese guide Bernardo Barretto. Flamingos are the only known lesbian birds: one of many discoveries that stayed with me. Although I was a birdwatching newbie, this wasn’t my first foray into the world of our feathered friends. Ten years ago, I made a start on a novel, tentatively titled All About Birds. Requiring some research, I studied with great interest a book called Biological Exuberance: Animal Homosexuality and Natural Diversity. Flamingos are the only known lesbian birds: one of many discoveries that stayed with me after reading that book. Kevin continues to wax lyrical about being the gull guru, despite Bernardo’s squawks of delight as he spots a Caspian tern. I took Kev’s card and said I’d let him know when his name was in print. A half-day tour, which is what I took on that misty midweek morning, might be enough for a birdwatching beginner, but a more seasoned bird-lover may prefer a longer session. The following day, Bernardo took my companion and I on a ten-hour tour. During that time, around the cork oak woodlands of Pancas and in the Barroca d’Alva rice-fields and pastures, we took in not just birds, but flowers, trees and insects too. Bernardo – patently passionate about all aspects of nature – walked us through a forest of cork trees, explaining how the cork is harvested and proudly telling us that Portugal is the biggest producer of cork worldwide. Wearing a khaki bushwhacker hat to keep the sun out of my binoculars, my joy at excitedly ticking off every species I identified made me, according to Bernardo, a bona fide twitcher. A twitcher, apparently, is a mildly derogatory term for a birdwatcher more obsessed with the listing than the looking. By the end of day two, I had seen 68 species of bird. Not a high score, Bernardo tells me – other tourists have seen around 100 in a day. I scoured the list of 160 bird-types again, just in case I’ve missed one. 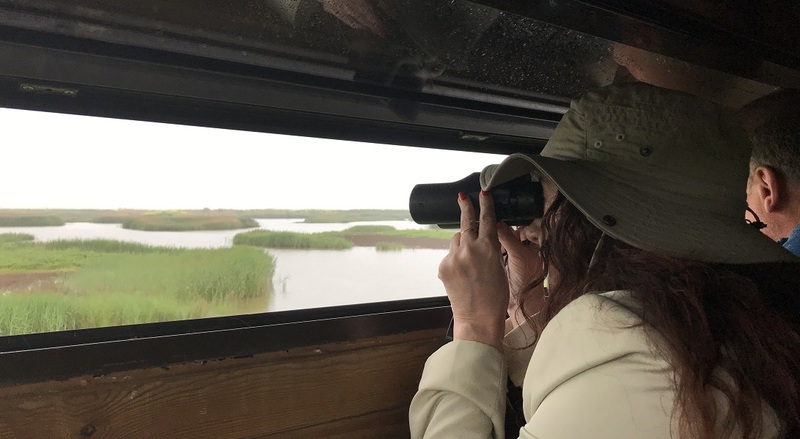 On the third day – grey and drizzly – a still enthusiastic Bernardo drives us to the EVOA Center (the Tagus Estuary Natural Reserve), located in the heart of the most important wetland in Portugal, about 50 kilometres outside Lisbon. In this ark of a building, built in 2015, we learn, via colourful information boards, about birds of the region. In the EVOA café, we enjoy some thick and tasty homemade fish soup. (I am kind of glad it isn’t chicken). After lunch, we check out a few ‘hides’ – shed-like man-caves dotted over the grasslands. In one hide, we find birdwatching ‘god’ Frederico Morais, posted since the crack of dawn, hoping to espy some rare species. He’s disappointed. The fact that he holds the record for spotting the most (309) species of birds in a one-year period perhaps makes up for the lack of sightings on rainy days. As we drive away from the site, Bernardo screeches to a halt in the mud. “Look, look! A purple heron!” A large-winged, rather ungainly creature flapped across the piece of sky directly in front of the car. “You can tick that off your list now,” he laughs. But, newly-hatched twitcher that I am, I tell him smugly that the ticking has already been done. * Globally, there are between 9,000 and 10,000 species of birds. 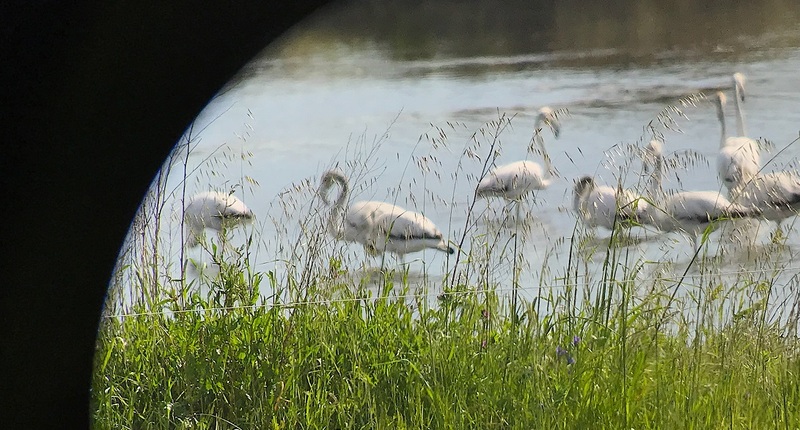 The avifauna of mainland Portugal itself includes a total of 465 species recorded in the wild according to Sociedade Portuguesa pars o Estudo das Aves (SPEA), Portuguese Society for the Study of Birds. * In 2017, research by academics at the University Of Exeter, the British Trust for Ornithology and the University of Queensland found a strong link between birdwatching and improved mental health. * In a recent article in Condé Nast Traveller, urban birdwatching was picked as a top trend, with the likes of Damon Albarn and Bill Bailey cited as fans.